Leave the secrecy to costumed quests. 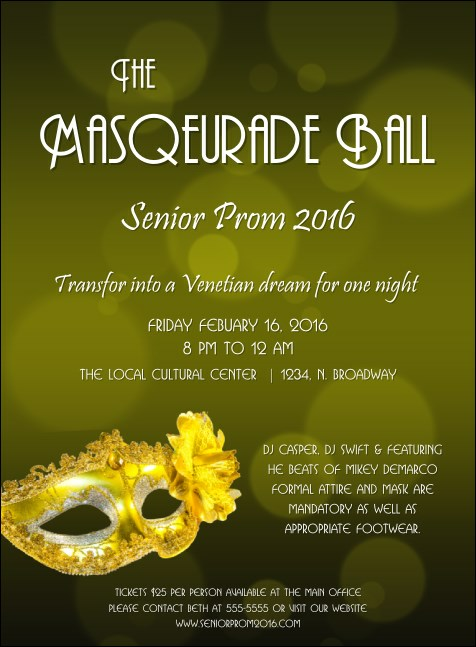 Use customized Masquerade Ball 2 Invitations to announce your gala. A gilded Venetian-style mask sits within this invitation template’s rich olive background, atop which white, Art-Deco-inspired text presents event particulars. Expect your order to turn around in one business day. Dimensions are 4.14" x 5.63"
Inspire a deluge of RSVPs with beautiful, custom printed invitations from TicketPrinting.com.